The Regular Process for the beatification, began in Palencia, in 1952. After being given the Cause in Rome, were instructed two processes: one extension, Malaga (1979) and another in Palencia, as apostolic process (1981-1982). The written decree of approval issued on October 21, 1965. The decree on the heroic virtues, on April 6, 1998. A miracle of a sudden healing of tuberculous peritonitis was brought to Rome and was approved by the doctors on 3 December 1998 and the theologians gave their approval, the April 9, 1999. On 1 December the same year, the Cardinals presented approval of the miracle through the intercession of D. Manuel González García and the Pope signed the decree on the 20th of the same month. 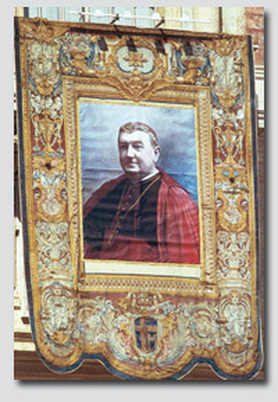 He was beatified in Rome by Pope John Paul II on 29 April 2001. During the study of the Cause in the Congregation of the Saints had to study these calumnies that up and it would be difficult to enumerate. The figure of D. Manuel came out unscathed from all these attacks, it being very clear that he was really "The bishop martyr", the "faithful shepherd" who does not abandon his flock and he is willing to give his life for them. Following the beatification have been many favors obtained through the intercession of Don Manuel. One may be the final special to bring to the altar. In November of 2008, a woman from Madrid had cancer of the mouth and throat, defined as the most aggressive and giving very little time to live. She asks the Sacraments and unable to go at that moment, the priest tells the husband that puts the relic of D. Manuel and start the Novena. On the fourth day that should start the chemo sessions, the doctor is Livid: gone totally cancer and says: Catholics say that it is a miracle, but I, I do not think, say that it is scientifically inexplicable. From these facts, more evidence began to certify healing; study by other medical equipment, biopsy, etc.. Everything comes to the same conclusion: there has not been scientifically a case. On 7 October 2009 the process began in Madrid, to study thoroughly this and that can lead to the canonization. This process closes solemnly by His Eminence. Mr. Cardinal-Archbishop of Madrid D. Antonio Maria Rouco Varela, on May 31, 2010 and will be presented to the Congregation of Saints in Rome in the second half of June. There have been many difficulties that have been fixed which have caused long delays. On 29 October 2015 a committee of medical experts from the Congregation for the Causes of Saints, said the healing of Maria del Carmen had no human explanation [Full Article Read Here]. On 15th December a commission of theologians, analyzed the alleged miracle giving its approval. 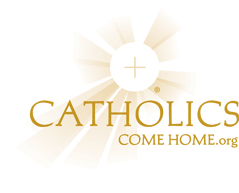 On March 1, 2016 gave approval from Cardinals and Bishops of the Congregation responsible for Causes of Saints. And on 3rd day of the month, the Holy Father authorized the promulgation of the Decree. Pope Francis canonized him along with 6 other Blessed on Oct. 16, 2016 at St. Peter's Square. The miracle took place in Palencia within the village of Requena de Campos, in December 1953 and in the person of Sara Ruiz Ortega, an 18 year old teenager who got paralyzed for 5 years because of a serious illness called tuberculosis peritonitis. 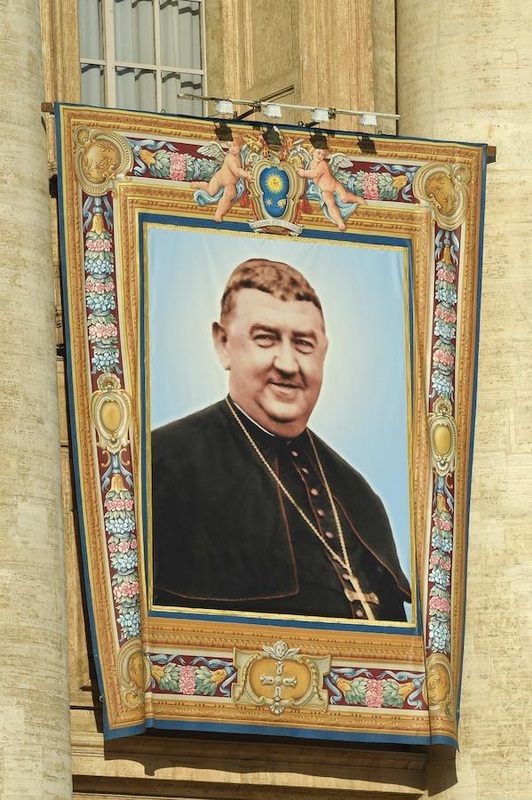 A priest went to the General House of Unión Eucarística Reparadora and obtain a relic of Don Manuel and put it under the pillow, without her knowledge, and began a novena through the intercession of Don Manuel Gonzalez. From that moment, and absolutely inexplicable to medical science, there was a sudden and radical change in the state of the sick and made her life normal again after 5 years. The five Servants of God, which I had the joy of raising to the altars, are witnesses of the extraordinary gift of the risen Christ gives to every baptized person: the gift of holiness...Blessed are those who make this mysterious gift fruitful, allowing the Holy Spirit to conform their lives to Christ, dead and risen! Blessed are you who like bright stars shine today in the firmament of the Church: Manuel González García, Bishop, founder of the Congregation of the Missionary Sisters of Eucharistic Nazareth...Each of you, devoting himself to Christ, the Gospel has made the rule of life. Thus you became his faithful disciples, having drawn that newness of life, which was inaugurated by the mystery of his resurrection, the inexhaustible source of his love. - - - Excerpt From the Homily of Pope John Paul II during the Beatification of Bl. Manuel Gonzalez Garcia and 4 others.